The graph below, based on data from the Federal Reserve Bank of St. Louis, shows manufacturing employment in the United States as a fraction of all employment. As you can see, the line heads downward in an almost perfectly straight line beginning in the mid-1950s. Notice that the line doesn’t become steeper as globalization takes hold after the passage of NAFTA in 1994 or the rise of China over the past decade or so. The line just slopes consistently downward. This is primarily the result of technology, and in particular, automation. Manufacturing in the U.S. has become dramatically more productive and requires fewer workers. 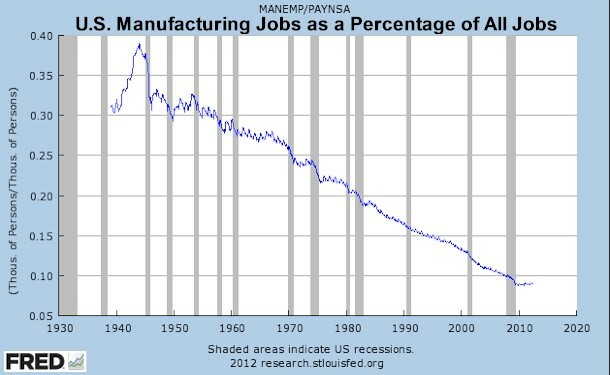 If we were to graph manufacturing output (rather than jobs), the line would slope upward, not downward. The value of U.S. manufacturing production is now far greater than it was in industrial era of the 1950s, even after adjusting for inflation. We just make all that stuff with a lot fewer people. One of the most interesting things about the graph above is that, if technology is the primary driver, then employment in China must inevitably follow the same path. In fact, there are good reasons to believe that manufacturing employment’s downward slope will be significantly steeper for China. The U.S. had to invent the technology to make manufacturing more productive, while in many cases China only needs to import it from more developed nations. It is also true that China is beginning its journey at a time when information technology (which is the primary enabler of automation) is many orders of magnitude more advanced than in the 1950s when U.S. manufacturing employment was at its peak. (See this recent article on skilled robots from the New York Times). In the U.S. (as well as in other advanced countries), workers shifted out of manufacturing and into the service sector — which now accounts for the vast majority of jobs. Will China be able to pull off the same transition? The U.S. had the luxury of building a strong middle class during an earlier time. Technology was advancing consistently and increasing productivity, but it was not so advanced as to create a mismatch between the type of available jobs and the skills of workers. Unionization was strong in the private sector and helped ensure that the lion’s share of productivity increases ended up in workers’ (rather that corporate owners’) pockets. Those workers, in turn, became the broad-based consumer class that purchased the output from all those factories and kept the overall economy humming. The situation in China is quite different. Consumer spending accounts for only about a third of China’s GDP (as opposed to 60% or more in nearly all developed countries). While China has built a significant middle class in absolute terms, it remains small as a percentage of the country’s huge population. The [Chinese] government actively enforces discrimination that tends to drive wages even lower. Much of the work in China’s factories is performed by migrant workers who officially live in the countryside but are allowed to come to cities or industrial regions to work. These workers typically live in factory dormitories and do not have the right to bring their families to the cities or to genuinely assimilate into an urban middle class. Wages for these workers are far lower than for urban dwellers, and the money that they do earn is for the most part either saved or sent home to help support their families. These workers are not in a position to become major drivers of local consumption any time soon. Even that level of worker availability and efficiency isn’t enough for Foxconn, which recently announced the introduction of huge numbers of robots. That may be a great way to drive production, but it’s hard to see how China will succeed in dramatically shifting its economy toward domestic consumption. And that has to happen before a shift to a service economy can take place. As consumers become more wealthy they begin to spend a larger fraction of their incomes on services — things like banking, insurance, healthcare, education, entertainment and travel — and that in turn drives service sector employment. At least that has been the path followed in other developed countries. In the absence of consumer spending, China’s economy remains highly dependent on manufacturing exports and, especially, on fixed investment. An astonishing 50% of China’s GDP is driven by investment in things like factories, housing and infrastructure (the U.S. figure is around 15%). The problem is that all that investment has to ultimately pay for itself, and that happens via consumption. Once a factory is built it has to then produce something that gets sold at a profit. Homes, retail buildings and apartment complexes likewise have to be sold or rented out. Obviously, no economy can indefinitely invest anything like 50% of its output without eventually finding a way to get a positive return on that investment. Achieving that return requires consumers — either at home or abroad. China continues to rely heavily on consumers in the U.S. and Europe, but that’s unlikely to be a sustainable formula for growth. The debt crisis and the resulting austerity is cutting into economic growth and consumer spending in both Europe and the U.S.
As manufacturing automation increases (perhaps dramatically) in China, in the U. S. and other developed countries the most disruptive impact from technology will be in the service sector — where millions of white collar jobs and service jobs in retail, distribution, food service and other areas may ultimately be at risk. After all, if robots can build an iPhone, then its a good bet that they will also someday be able to build a hamburger or mix a latte. The result may be continuing high unemployment, stagnant wages and tepid consumer spending throughout much of the developed world. The real problem China faces is that it is late to the party. Just as it reaches its manufacturing employment zenith, it faces a potentially disruptive impact from automation technology. And that will happen roughly in parallel with similar transitions in the service sectors of the countries that currently consume much of its output. In the face of that, can China succeed in re-balancing its economy toward consumption, increasing personal incomes, and building a vibrant service sector to keep its population employed? 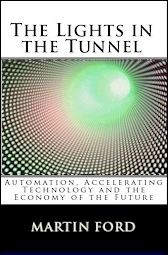 I’m presenting a Paper on Technological Unemployment at the Basic Income Earth Network (BIEN) Congress here in Munich next month. 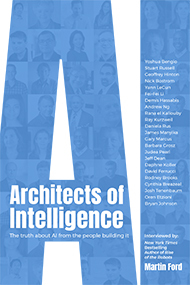 I’ve Cited you, (and your Key Point that Automation follows Outsourcing), as a source, and I’ll send you along an advance copy of it for you to Vet. I’ve come up with a novel, and incredibly *cheap* solution that is both *politically and economically viable* that can mitigate a lot of impending social unrest issues surrounding Technological Unemployment, issues that the NYT article doesn’t even come near to addressing. I’m finishing writing the Conclusion right now where I go into details on this and will have it out to you by this time next week, I think that you’ll be quite pleased with what I have to say. What about China buying up U.S. assets, land, and gold like crazy as well as their ‘anchor babies’ and stealing our intellectual property? The Japanese bought Rockefeller Center too and sold it for a loss later. Buying up US assets is not a big deal unless it affects food and security. According to the US Bureau of Labor Statistics, Chinese manufacturing employment peaked at 125 million people in 1996. In the most recent year with data available, 2008, manufacturing employment was down to 98 million. The best since the turn of the millennium was 2006, with 112 million employed in manufacturing. Hourly costs for Chinese manufacturing workers more than doubled between 2002 and 2008, though wages are still very low by American or European standards. If politicians are going to spend our money, and say it’s best for us, they should spend it on something we actually want. Lot’s a people want to cheer every time a robot put’s someone out of work. I’m for a fully automated robotics factory, with self replicating robotic arms. Highly automated renewable energy, windmills or underwater water mills. Highly automated steel production. Highly automated chip manufacturing, and Linux. I’ve seen some automated building manufacturing companies starting up as well. Other prerequisite products can eventually be manufactured as well. All source code and blueprints have to be fully owned with rights to an infinite amount of use. All owned by the citizens of the country concerned. Small factories at first, with all of the bugs worked out, so that it largely builds itself in the end. It should be affordable, I’m an economic conservative. Eventually the complex can produce consumer goods besides steel, energy, chips, buildings, and robotics. Charities and the open source community can help as well. I’ll license source code in myself, with a liberal model that allows infinite replication without cost and resale(one time fee model). If we can’t get income from jobs from our productivity, then we had better extract taxes from those making profits from such productivity — much as Saudi Arabia does with oil. I have read your book “The Lights in The Tunnel” and I completely disagree with your opinion on China. New York of Time is one of those well-known anti-China newspaper (along with most of the western mainstream media) and by relying on such biased information, it distorts the neutrality of your analysis. If you want to be really objective then not only you should gather info from other media that are not particularly pro US/western, but also those who are anti US/western since you’re already have info from pro US/western media. Only by analyzing info from these opposite views will you be able to be as objective as possible. Personally I do agree with many points in your book and while their logic is a BIG reason why I do, the BIGGER reason is that it’s due to you’re not aiming at a certain country..
You also underestimate the capability of the Chinese government to do something when they decide something on a grand scale. Whenever there was a conflicting story on China, there appeared to be an influx of pro-China emails in answer to the article. This happened over at Slate Magazine one year and the place was deluged with pretty obvious China posted answers. I am going to assume you are Chinese. You disagree on China, yet you offer no opposing facts while Martin posts from Fed data and the NYT. China has always tossed labr at manufacturing first and then modernized it throughput. If you took the time to read “all” of the NYT article, it gives China quite a bit of credit for being able to come to the market with a product faster than the US. But then, US workers do not live in dorms and get there meals there. I am amazed China has not tossed capital at the process as much of the assembly should be done by automation with all of the surface mount electronics done on wave soldering lines. My company is now sourcing outside of China as the incremental increase in Chinese lifestyle has made it unprofitable to justify the supply chain coming back to the US plus the Chinese labor cost other than to sell in China. Our China facility is sorcing outside of China also. If a company wishes to sell in China it must build in China as the logistics are horrendous and the tax structure bringing product and components costly even for something as simple as car floor mats. One disadvantage the US has is it waived much of its rights with the WTO when it signed those agreements without exceptions, something many other major country. China is restrictive in what can be brought into China. Apple is a trans national company and is in for themselves. The NYT does an excellent job of detailing the profits being made by bypassing all of the US Labor and Environmental regulations which comes in the form of Overhead to the cost of manufacturing. You must know by now, Direct Labor cost is the smallest portion of the cost of manufacturing and whether it is $17 a day or an hour, the cost does not match up to the cost of Overhead in comparison. Which brings me to another point. If you bring capital into China, you can not bring it out (unless it has changed as of recent). Capital is also costly and exceeds the cost of labor initially. So would it make sense to build a capital intensive factory or one which is labor intensive and can be closed with the lay off of labor? Whether you realize it or not, China is soon to be faced with similar problems as the US with regard to Labor. Yes, I’m afraid China has a paid army of keyboard warriors who will swarm any article that dares to challenge their inflated view of China. Don’t bother arguing with them.